Robin M. Rios is a photographer, digital artist, and founder of the 4Art Inc. Gallery in Chicago who occasionally turns her projects into custom skateboard graphics at BoardPusher.com and we’re always stoked to post them as Featured Decks. Today’s is “From Beneath the Rubble”, a fusion of shots from her local skyline. See more of Robin’s projects at robinmoniquerios.com, follow her on Instagram @robinmoniquerios, and pick up one of her skateboard designs at BoardPusher.com/shop/Robin_M_Rios. 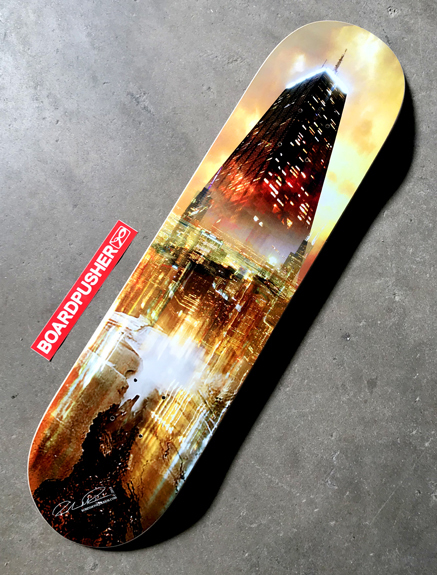 Upload your images at BoardPusher.com to create your own unique custom skateboard graphics.